Fr Shane (27) is the newest priest in Waterford & Lismore and one of fifteen ordinations to the Irish Church this summer in what has been a bumper year for vocations. The new bishop of the diocese of Waterford and Lismore, Bishop Phonsie Cullinan, oversaw his first ordination to the priesthood in the diocese on Sunday since his own installation last April. 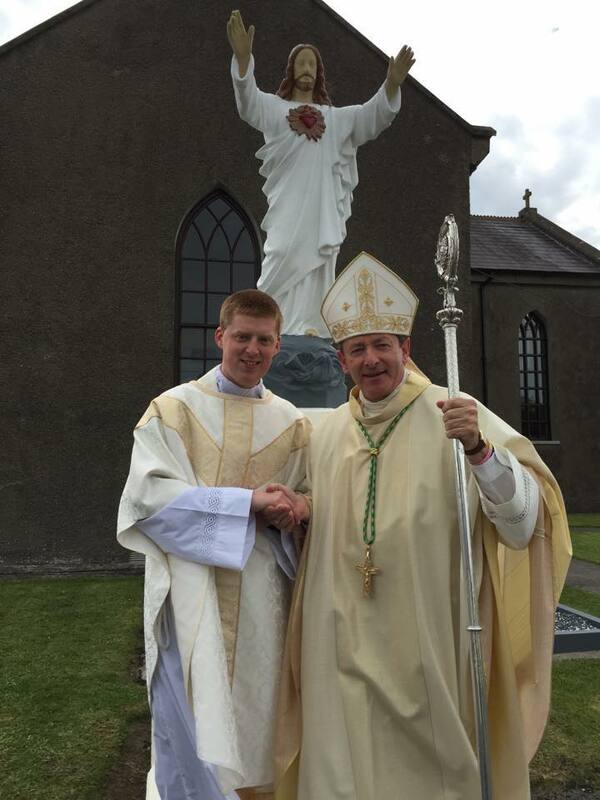 Fr Shane O’Neill was ordained at the Church of the Sacred Heart in Knockanore at 3pm yesterday. The twenty-seven-year-old was joined by his parents, Patricia and Tom, and other family members, as well as his parish priest, Fr Pat Condon, along with other priests from the diocese who con-celebrated the ordination Mass. Fr Shane is now the newest priest in Waterford & Lismore and one of fifteen ordinations to the Irish Church this summer in what has been a bumper year for vocations. He will celebrate his First Mass of Thanksgiving at 7.30pm this evening in the Church of the Sacred Heart in Knockanore. On Thursday, he will be in Holy Cross Tramore to celebrate a Mass of Thanksgiving for all the parishioners who got to know him during his time there as part of his pastoral experience programme. Fr Shane has a Masters in Old Irish from UCC and he used to help out at Ring Irish Collage during his summer holidays while a student at the university in Cork. Last April, in his statement following his ordination as bishop, Dr Cullinan called for prayers to promote vocations in Church. “I am convinced that there are many more who, with the right encouragement, can be helped to make life commitments in the Church, whether that be to marriage, religious life, the permanent diaconate, or the priesthood,” he said. Later, Bishop Cullinan added that he would like to personally drive new vocations. “I’ve got to go out and ask ‘would you consider a vocation to the priesthood or religious life?’ and we’ll see who will respond,” he said.